After the cold open of Rogue One, the Star Wars film franchise will return back to the time-honored tradition of opening crawls in The Last Jedi, and director Rian Johnson confirms that it will be full-length. The opening crawl comes before every entry in the main series of films. In most cases, the opening crawl sets up the plot and bridges the gap between movies; usually, subsequent films occur after several years of in-universe time with the distance between The Return of the Jedi and The Force Awakens being 30 full years. But per what we’ve seen from the recently-released teaser trailer, The Last Jedi resumes right as Rey hands the Skywalker lightsaber back to Luke. So what’s the point of having three paragraphs of opening text to a film that occurs mere moments after the one that came before it? In the final moments of 'The Force Awakens,' Rey reached out to Luke Skywalker with the lightsaber he lost more than three decades prior. 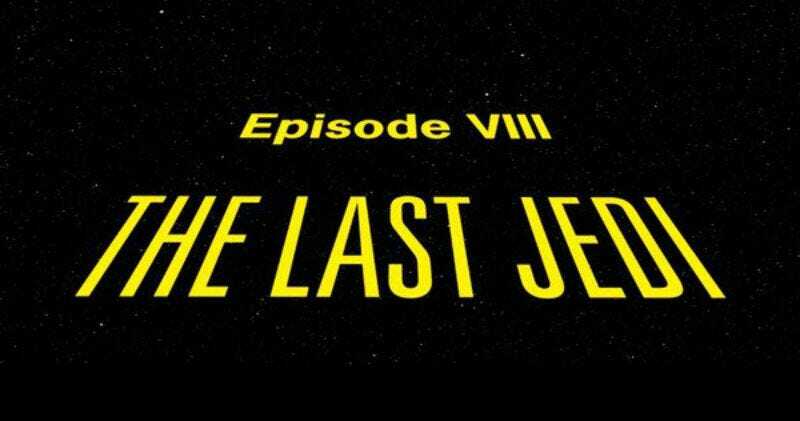 Expect the opening crawl to CAPITALIZE all the proper nouns deemed central to the plot. In the past, words like FIRST ORDER, REPUBLIC, and RESISTANCE have been capitalized, so expect reminders about the death of Han Solo at the hands of Kylo Ren during the destruction of STARKILLER BASE along with updates on other central characters like Luke, Finn, Rey, and Poe. Star Wars: Episode VIII — The Last Jedi hits theaters December 15, 2017.